When you commission a team to survey, design and install a replacement roof you rely on their trustworthiness and competency, forming an unbreakable chain of trust throughout the process. Here’s a story about a roof we inspected where a link in the chain was broken. Was it poor roof installation or something else? The whole roof surface, including a timber deck, has come off. How did this happen? SIG Design and Technology were asked to survey a large factory in the North East of England which was experiencing numerous leaks. We found the metal deck was in reasonable condition, but the membranes had failed on all areas. The client asked us to put together a repair and maintenance programme for the next five years. Whilst we were working on the detail of the maintenance programme, we were called back to site because there had been a catastrophic failure of the roof, as you can see above. 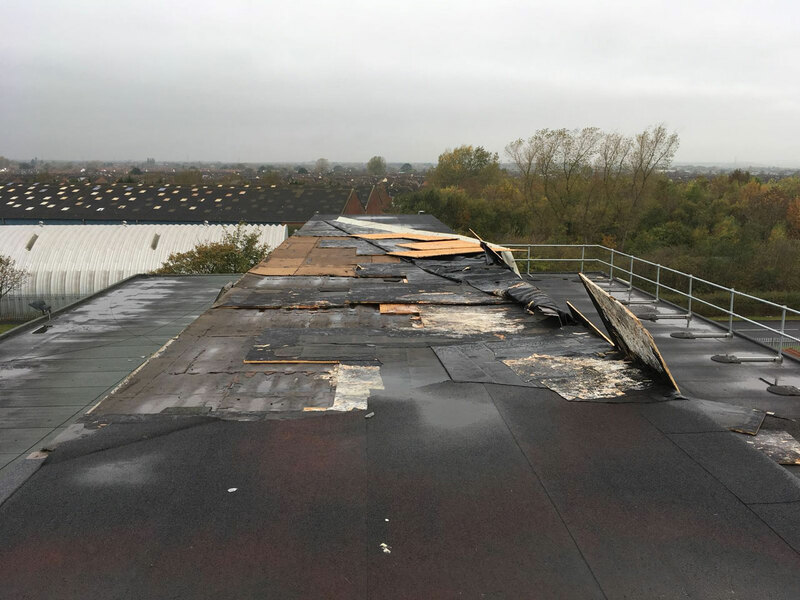 An area of approximately 400m² of roofing, together with a timber deck, had blown off the roof. The photograph shows around 100m² of this area – the remaining 300m² are behind me as I took the picture! It transpired that this area of roof had been subject to a large repair by a contractor we will not name, a few years beforehand. The contractor had fixed a timber deck over the top of the existing aluminium deck before installing a new roofing membrane. This was a reasonable decision in itself, but it hadn’t been executed properly; the contractor had used the incorrect fixings. Instead of using fixings suitable for fixing timber into an aluminium deck, they chose fixings suitable for a steel deck. These fixings had failed, and high winds had lifted off whole areas of the roof, exposing the factory to the elements. The roof failure could not have been foreseen by anyone except the people who chose and installed the wrong fixings because they were all concealed below the roof. We don’t know why they did it, it may have been due to failure to identify the deck properly, it may have been the availability of fixings, it may have happened during the roof installation, or it may have been for some other reason. Unfortunately, the client had to rely upon the good behaviour of his team, who let him down somewhere along the chain. SIG D&T brought in a fixing specialist who carried out fixing pull tests and recommended the correct fixings to use on the roof replacement. 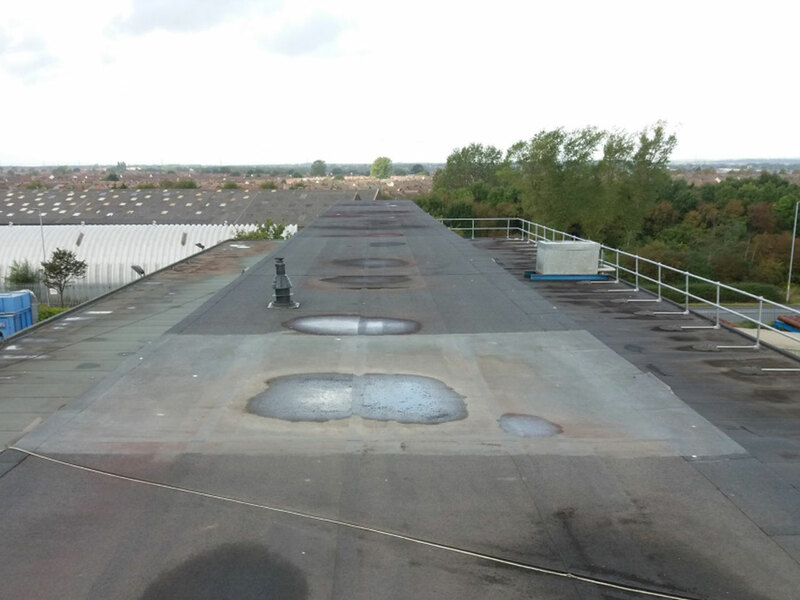 This 400m2 of roof repair then became the first phase of a project which will see a total of 12,000m2 of roof installed to the factory over a period of time; these areas have been identified and prioritised by SIG Design & Technology and set out within a planned maintenance schedule for the client. The project was completed last year by a DATAC accredited contractor, and the factory operatives are now able to work in an environment free from the threat of leaks and falling roofing materials. It isn’t easy to choose a team to take on the responsibility of looking after your flat roofs. But there are some things you can make sure this scenario doesn’t happen on your project. Ensure you choose a team with a strong track record, who will have the experience to know that the right materials and fixings will be essential for performance. Don’t be afraid to ask for previous clients and ask them for references. Make sure your team are roofing specialists. Specialists in their area of expertise will know the nuances of the materials and won’t make assumptions. They will also be able to call on other specialists when required for advice, rather than assuming they know all that there is to be known. Recruit for the long term. A team that has a long-term commitment to keeping your roofing in good condition throughout its life will make sure the chain isn’t broken, whereas a fly by night cheap solution will ultimately result in higher costs and greater risks. Ensure that inspection is part of the roof installation process. Technically competent inspection during installation will give you the confidence that the correct materials and fixings have actually been put on the roof, not substituted due to convenience or cost savings. When you commission a team to survey, design and install a replacement roof you rely on their trustworthiness and competency. Find out more about why we are that team here, and when you’re ready to call on our expertise, get in touch.